Ainsley Maitland-Niles admits Arsenal are now dreaming of a return to the Champions League. 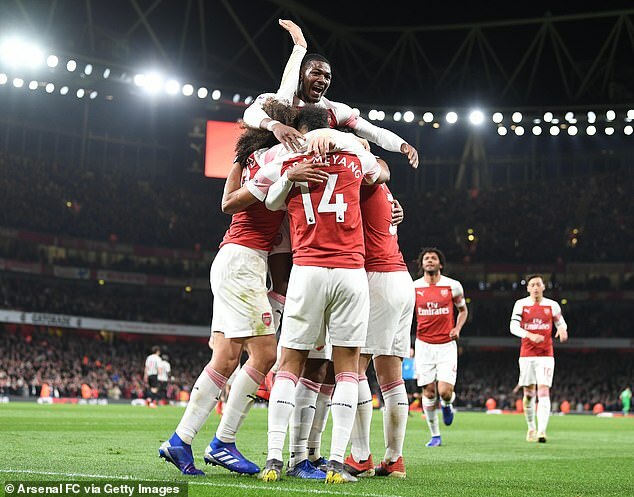 The Gunners beat Newcastle 2-0 on Monday night to move ahead of Tottenham and Manchester United into third place in the Premier League table. The last two seasons have seen Arsenal finish outside the top four and have to make do with Europa League football – reaching the semi-final last season and facing Napoli next week in the quarter-finals. After 19 successive years in the Champions League before their recent slip, Unai Emery replaced Arsene Wenger last summer tasked with taking the club back to Europe’s elite club competition. Goals from Aaron Ramsey and Alexandre Lacazette were enough to see off Newcastle and take Arsenal two points clear of neighbors Spurs. Now Maitland-Niles, who made his Arsenal debut in a 2014 Champions League group game against Galatasaray but has not played in the competition since, is eyeing a return. ‘It’s every team’s dream to play Champions League football,’ he told the club’s website. Arsenal’s rise has been rapid as they sat 10 points behind Spurs only a matter of weeks ago.